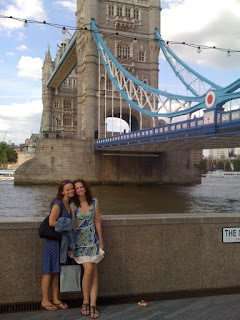 The Adventures of Big Apple Angie: Au Revoir, Londres! Bonjour, Paris! Au Revoir, Londres! Bonjour, Paris! With London already in the rear view mirror, we're finally settled into our rental apartment in Paris' 1st arrondissement. We're nearly next door neighbors to the Louvre and will be visiting on the next available rainy day. I've been sitting down for the past 30 minutes and I feel guilty... like I should be out in the world soaking up some monuments. Truth be told, I'm still sick, it's raining and I AM LE TIRED. RaeRae is taking a quick catnap while I communicate with the world (yeah, so much for disconnecting) and we're planning to head out a little later to get a first glimpse of the City of Light. After spending something like $40 on a croque monsieur & pasta carbonara (unexpected fried egg on top) this afternoon, perhaps we will do some fasting for a few days to conserve funds. Eiffel Tower or food? Tough, tough call. I told Rae to put on a sad face and start begging. Poverty aside, I've been trying to upload photos to Facebook but am having trouble... so here are a few for now. How amazing is this? The Globe Theatre built just as it was in the 1500s. RaeRae's best Anne Boleyn face in front of the Traitor's Gate at the Tower of London. 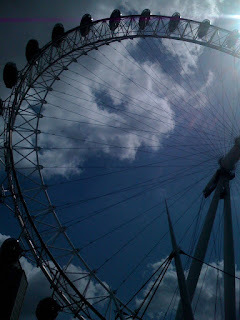 The London Eye - we didn't go up, but it looks lovely. 1) Your sister is GORGEOUS. 2) You could be twins! when i was in france, i ate a jambon fromage baguette for basically every meal.